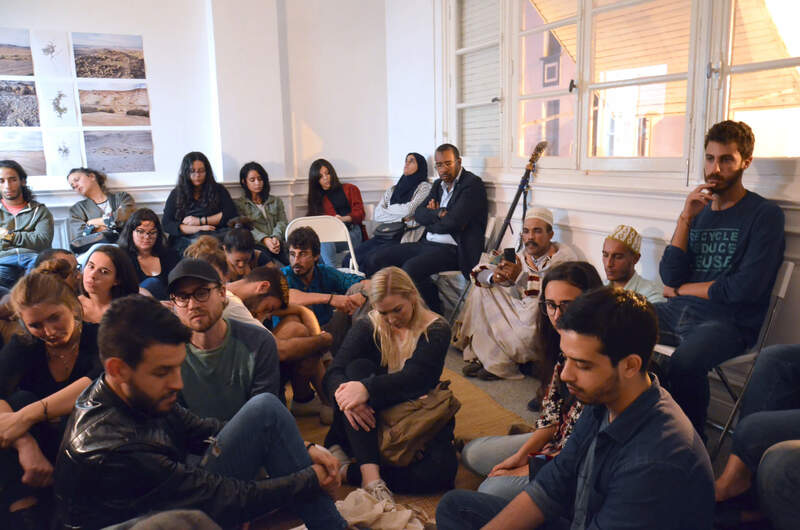 In the troubled context of today, part of the Moroccan community in Belgium is developing new practices linked to a fascinating branch of its heritage, the gnawa culture, in the fertile territory for creation and cultural diffusion in Brussels. Currently, its members resist in their own way by locally transmitting the haunting aesthetic of the traditional Gnawa music that is characterized by the captivating sounds of specific instruments, such as the guembri, tbel and qrâqeb, and songs, while being accompanied by the physical, mystical and ritual dimension of these trance practices. Mohamed-Saïd, Hicham, Souhaib, Saïd and Hélène live in Brussels, where they act locally, with discretion, but also with ambition and conviction to transmit this culture whose social and cultural role contributes to the global influence of the Belgian capital. The group listening session is introduced by a concert of the gnawi Tayb Coyo extended to an exchange between Julien Crespin, Chloé Despax and the public. Gnawas jour et nuit (2017 – 50min) has been produced by Julien Crespin and Chloé Despax, with the support of the FACR of the Wallonia Brussels Federation, and the acsr. This event falls into the framework of Attokoussy, a project of art and collective research that opens a space for reflection and expression on rituals and beliefs in Morocco.